Today is a good day. I just got out of a two-hour meeting about air cleaning products. First, I’m happy that a two-hour meeting is over and second, I’m excited to re-visit some older products that have been improved and some new things that when combined in the right way will give your home the best possible cleanest air on the planet. We classify air pollution in three categories; germs and infectious agents, chemical gases and odors, and particles and allergens. Germs & infectious agents: These consist of viruses, bacteria, mold, the flu virus, pollen growth and more. Chemical gases and odors: These include chemicals, pesticides, cleaning projects, formaldehyde, building materials, VOC’s. Particles and allergens: These are things like dust mites, skin flakes, pet dander, smoke & hair. Each of the three categories requires a different approach when it comes to combating them in the home. Face it, your home is polluted! In a Harvard University Silent Spring Study, 100% of the homes tested had toxic compounds including pesticides, chemicals found in furniture and building material, as well as cleaning compounds that can be the cause of asthma, allergies and other ailments. If you’d like to be thoroughly frightened I suggest spending some time here. The EPA takes it even a step further and states, “Indoor air can be 2-5 times and as much as 100 times more polluted than outside air”. So, we know the air is dirty but how can we combat each of the categories? Let’s start with the germs and infectious agent category. We can actually disinfect the air in your home through the use of high output UV (Ultra Violet) lights. Standard UV lights only kill germs and prevent mold on the interior surfaces of your HVAC system whereas high output UV lights actually sterilize airborne viruses, bacteria and germs as they pass by the lamp, rendering them harmless and unable to reproduce. These lights have a kill radius of up to 24” so when properly placed in the duct system the air just gets less infected with every pass by the light. The bulbs have a two-year life span. Oh, and do yourself a favor… never, never, never look at a high output UV light when it is on! You will end up with very badly burned eyes, possibly the worst pain of your life, and it will take weeks to heal. Next up we have the particles and allergens category. The best weapon we have against these guys is a polarized media cleaner. Unlike a standard filter that only filters particles to around a 5 micron size this cleaner gets the nasty stuff out of the air all the way down to .3 microns. To put the size of a micron into perspective a single human hair is around 50 microns in size. The other thing you need to know is that 98% of the particulates floating around are less than one micron in size. One side of the filter is charged with a positive ion, the other side is charged with negative an ion stream which is what make this media so effective. Every particle on the planet either has a positive or negative charge so they will all be attracted to one side of the filter or the other. Depending on the conditions in the filter pads they will last anywhere from 2-4 months. Ok, final category time. Chemical gases and odors can be eliminated through use of an ozone generation system. Wait! Before you start freaking out that ozone is dangerous know that the second you walk outside every day you are exposed to around 50 parts per billion of ozone. The unit that we install, at maximum output, only generates 30 parts per billion of ozone, much less than you are exposed to daily. How does ozone fight odors and chemicals you ask? Simple. Ozone is made of three molecules of oxygen combined. The third molecule of oxygen attaches itself to the molecule that is causing the smell and through a rapid chemical reaction the ozone changes the structure of the offensive molecule to something harmless. The same principles apply when fighting chemical gases. Weird science stuff, right? 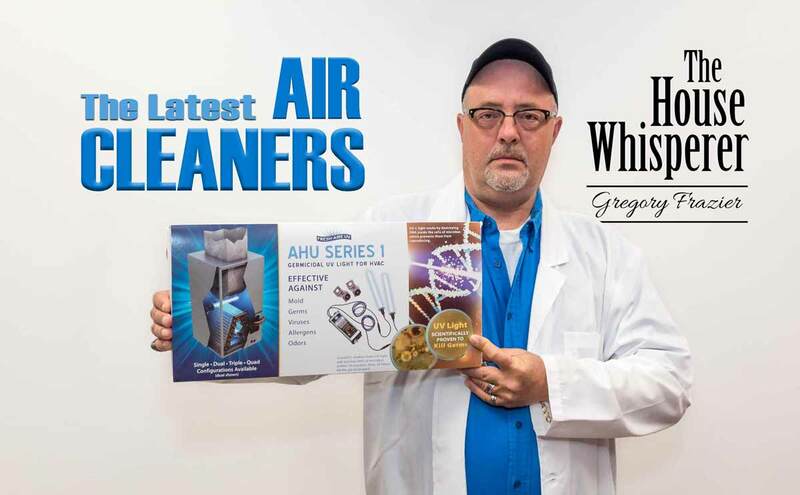 We also have a couple of over the top options available for those who have chronic respiratory issues, feel free to inquire within if you are a person that needs the ultimate air protection. We can lessen asthma attacks, and other breathing issues so don’t hesitate to contact us. My final thought for today… everything above is focused on your personal health. Let’s not forget the health of your AC system as well. Back to the EPA for a second, they state that “a buildup of .42 (1/20) inches of dirt on a heating and cooling coil can result in a decrease in efficiency of 21%”. A Texas A&M study also found that a mere 1/8” of dust on a blower wheel can reduce airflow by up to 30%. It would be a shame to get a brand new super high-efficiency air conditioner and have it lose airflow and efficiency 30 days after it was installed because you bought a crappy filter. Sorry I was so long winded today but these things needed to be shared. Until next week friends and family, have you ever stopped to consider what a ground breaking invention the shovel is?